Nestled in the foothills of some pretty stunning mountains where visitors can explore nearly 2 million acres of wilderness! This tiny mountain village was listed as one of the 100 Best Small Art Towns in America and the region is far enough south to be spared the many storms that often touch the northern part of this state giving this a pleasant year-round climate with four distinct temperate seasons. Hunters from all over the country converge on this area during September, October, and November to take on the challenge of the best hunting in the US – primarily Elk, Antelope, and Deer. While historic logging and mining days are all but over, many other opportunities exist for visitors which include hiking, horseback riding, mountain biking, canyon rock climbing, hunting, and four-wheeling to name a few. Some 190 miles of trails are located throughout the area Mountains where maintained roads total about 500 miles with another 600 miles of unimproved roads. Remember, we must rest on occasion too, so you’re most likely to get ahold of us between 9 am and 5 pm eastern time M-F. 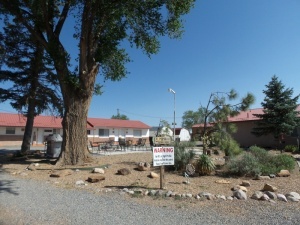 Located in a high desert area with blue skies and warm sunshine! The area has miles upon miles of open range where working cowboys still roam, endless horizons, magnificent underground caverns and five municipalities which are meccas of activity! This area is experiencing a high growth and this park is perfectly positioned to house all the workers coming into the area! Open all year with 40 full-service RV sites catering to traveling nurses, craftsman, construction crews, road surveyors, pipeline workers, wind farm and power plant workers and the list goes on. It’s 3 acre’s are level and shaded with a three-quarter acre expandable area. City sewer and city water. The registration building also serves as the managers living quarters. We’re super excited to talk to you about this great park! There’s a good chance that you’ll be wanting to learn more about this campground so give us call and we’ll share all the details not mentioned in this ad. Remember, we must rest on occasion too, so you’re most likely to get ahold of us between 9am and 5pm eastern time M-F. Operational RV park inside the city limits. Sold for land value. Seller is a retired Real Estate Agent. It’s perfectly located as a base camp for a vacation at the lake with an abundance of fresh air and beautiful skies! This park is a haven to relax and unwind in a desert oasis where you can overnight it or spend an indefinite time soaking in it’s in wide open spaces, mountains, deserts, wildlife, and authentic culture. The mountains and plains abound with wild game, from quail and rabbits to mountain lions and bears, and let’s forget the old mines, ghost towns, and hiking and biking trails. The cost of living is extremely reasonable and many a retiree have moved here from colder climates. Two large area lakes make this region an attraction to tourists and recreation seekers when as many as 100,000 people come on holiday weekends. Personally, we think you will be impressed and surprised by the quality of life, and the beauty and variety of attractions found here. 19+ acres inside the Tahoe National Forest; Willow Creek, a year-round, gold-panning ribbon of reflective light. Water well of great capacity and quality (four years of quarterly analyses + fall 2018 test); Comprehensive septic system (25-page county record; Inspection certificate). 20 tent sites / Additionally, possible “wilderness camping” up in the woods. GREAT business opportunity! The active “Good Sam” awarded RV park that operates from the end of May until the end of September includes 42 full hook up sites, 8 overflow sites plus several tent campsites. In addition, there is a two bedroom, one bath cabin (that is rented through VRBO year around), a 640 s.f. retail shop/office, a 1200 s.f. rec hall, a laundry/shower facility, and a 1200 s.f. metal shop as well as a large open-air pavilion and fire pit! The park is located in the tourist town of South Fork, Colorado, 17 miles from Wolf Creek ski area boasting the most snow in the state, where the Rio Grande River and the South Fork of the Rio Grande river flow through town, teeming with trophy trout, and where the Rio Grande Club championship golf course is located. At 8200 feet elevation, we have cool summers and are surrounded by public land forest service making for great hiking, biking, ATVing, fishing, skiing, and golfing! A very successful jeep business (with four jeeps) may be purchased for an additional 224,000 which includes all books, client lists, and proprietary information related to the rental business. The park is located in the heart of South Fork next to the Community Center, pickleball courts, and softball field. ATV’s can be driven right from the park into the forest service roads. Located in a gateway city and 5 miles off a major north and south interstate. This seller had the vision to combine a drive-in theater with an RV Park and the result is unbelievable! This truly unique business model allows the community to attend the drive-in with a 40-car capacity and a lawn sitting area so the RV’ers can walk on over and view the movie too. The drive-in shows first run and classic movies on Friday and Saturday nights only. The area is a hidden gem and while you can see it from the interstate, it’s a gem hidden in plain sight. There’s no good time for guests to visit because there are family-friendly events and festivals year-round. This southern region offers so much more than meets the eye from the interstate! The RV Park and drive-in are all one year new and built from the ground up. They were at capacity within the first 2 months of opening. The owner is contemplating adding more RV Sites and possibly adding storage units. 69 Acre KOA RV Park located in Victoria, TX walking distance to the Victoria Coleto Creek Reservoir. RV Park takes up 24 acres with 45 acres available for proposed expansion. Features include 124 Full Hookup RV Sites, Back-in and Pull-thru Sites, 3 Deluxe Cabins, 50/30/20 Amp Electrical Service, Cable TV and Wifi, Propane Onsite, Swimming Pool, Dog Park, Playground, Fishing Pond, and Nature Trail. Facilities Include Air-Conditioned Laundromat, 3 Air-Conditioned Full Private Restrooms with Showers, and a Clubhouse with Full Kitchen. Located in an area that is small enough to have the warm, inviting small-town feel yet just a quick 30-minute drive to amenities and comforts of a city much larger! The climate is excellent with four distinct seasons and mild winters. Outdoor adventures can be enjoyed year-round and visitors to this area can find mountains and canyons, ruins and fishing, off-roading and hiking and so much more! These owners built this park in 2006. Its 10 Full-Service RV sites are typically at 100% occupancy. Sitting on 5 +/– acres with roughly 1 +/– acres to further develop. RV storage area, small camp office, and propane sales. Custom built 3,674 square foot home is included in the sale. 5 bedrooms, 3 bathrooms, and a full basement. 3 stall attached garage. Also included in the sale is a 10,500 square foot heritage steel building currently used as an automotive machine shop. Three 12' x 12' overhead doors, one 12' x 14' overhead door and one 14' x 14' overhead door. There is a 1,400 square foot office, 3 overhead cranes, 440 amp 3 phase power and 2 handicap accessible bathrooms. This building is currently leased at $3,662.00 per month. Tenant is leasing 7,500 square feet of this building and pays their portion of utilities and $1,944.00 towards the property taxes. The additional 3,500 square feet can be used for a workshop or for storage of equipment or toys. Beautiful lakefront resort. Profitable business including 6 vacation homes, 16 RV sites, tent sites, 2 pools, dock and boat ramp. Also a large 30 x 50 Bunk House/Shop, outdoor kitchen, hot tub house, picnic pavilion, and storm shelter. Approximately 700' of shoreline on one of Bassmasters Top 100 fishing lakes. Turnkey and ready for you to continue operating. All lodging facilities include furniture, linens, dishes, pots and pans and are nicely decorated with antiques, collectables and locally sourced cedar furniture. Properties are reserved through VRBO/Home Away, Airbnb, RoverPass and our own website. We rent by the weekend, week and month. Property also includes pontoon boat, kayaks, canoe and life jackets for all sizes. All lawn mowing equipment, maintenance equipment and tools and holiday decorations for all homes. Great opportunity. Serious inquiries only, will not divide property. Looking to escape the city? This unique town is nestled in a valley alongside mountains and among the mesas of the high desert offering a unique lifestyle where you can enjoy the advantages of rural life. Imagine peace and quiet, star-filled nights, access to farm fresh eggs and local game, and the kids enjoying the freedom to ride bikes around town. This town doesn’t have it all, nor do they want it. This area has easy entry to over a 1000 square miles of public land offering diverse recreational opportunities including the only rock crawl park in the state on public land for off-roading, hiking, biking, fishing, hunting, boating and two national forests! The park is 20 years new, move in ready and well-designed on 5 level acres. This is sure to please! This park was built in 2005 on approximately 4.5 acres, has 3 hookups, 28 of them have concrete pads. All have 30, 50, and 110 services. The laundromat has 3 washers and 3 dryers, restroom and small office. Included in the sale will be 8 RVs that are rented out for $600.00 a month. Aerobic system, community water, rusk county electric. Less than 2 miles to Kroger, Walmart, restaurants, and fast food places, downtown is less than 3 miles away. Close to Martin Creek State Park, Lake Tyler, and Lake Striker. A gas plant is being built in late 2018 early 2019 in Troup Texas which is only 18 miles away. Will owner finance with $175000.00 with $200,000.00 finance at 8% for 15 years. Discount for Cash Sale. Call: Donald Harris @ 903-836-2006 anytime. Please, no phone calls, this is a business in operation with employees. Please respect our need for confidentiality and EMAIL ONLY. Stellar views, daily wildlife visitors, year-round recreation, and living lakefront are just a few of the perks that come with this place. Hunting, fishing, boating, jet skiing, water skiing, wakeboarding, hiking, biking, cross-country skiing, snowmobiling, and tons of off-roading adventures await you. All right outside your doorstep! Now a quick mention about all the delicious food and the cozy places to stay after all your adventures. There are 10 furnished cabins with restrooms, 14 RV sites with full hookups, a wedding and/or event venue (with lake views), and a full-service restaurant/bar and mini convenience store. The cabins are various sizes from the smallest size – a studio cabin for 2 up to the largest size – 4 bedrooms plus a loft that sleeps, 11 people. Each cabin enjoys views of the lake out front. The RV sites have a community area with a fire pit and horseshoe pits – with lake views. The gorgeous wedding venue views make for amazing pictures and memories! The whole place can be used for destination weddings, family reunions, business conferences, or retreats. There are also living quarters located above the restaurant for additional rental income or for the owners-again with amazing lake views! There are 3 bedrooms, 2 bathrooms, a large living room and kitchen with approximately 3,000 square feet of living area. Dining in the restaurant is a first class experience with more of the fantastic lake and wildlife viewing daily. Enjoy a hot toddy around the ginormous fireplace while watching the snowflakes fall outside. This is your chance to live in the Rocky Mountains and enjoy the great outdoors! Seller is a licensed Realtor in the state of Colorado. The trailer court, with 46 hookups including drinking water, septic and power. Two creeks, Deep Creek and Currant Creek. Fish Ponds on the west side. Sandstone mountains, a majestic backdrop for the property. This park is nestled in a grand valley, HIGH in some pretty stunning Mountains and in a town like no other! With less than 1,000 full-time residents, its annual visitors run in the many thousands! This is a recreation hub, however not a destination for those looking for upscale, but it is charming, authentic, and adventurous! The Town welcomes OHVs, ATVs, unlicensed motorcycles and other vehicles into town along designated and limited routes with access to county roads and a pretty awesome loop! Encircled by opportunities for hiking, backpacking, jeeping, skiing, snowmobiling, ice climbing, ghost towns, fishing, rafting, horseback riding and so much more! If you live in a major city, you’re probably spending a lot of your time every day sitting in traffic. That’s not an issue here. Ready to ditch the crowds and the corporate job, be your own boss and find solitude? A Park with a Big Heart! Surrounded by mountains, this Region is truly one of the best-kept secrets in the State! From glistening lakes and world-class rivers to scenic drives and back-country roads, providing something for everyone to discover and enjoy. This park is the perfect base camp for great recreation, adventure or pure relaxation – the perfect escape from the fast pace of city life. Guests come to this high desert area for the lush river valleys, rolling foothills, and volcanic wonders! They come and savor the uncrowded, unspoiled wide-open spaces where they have the chance to explore, reflect, refresh and bond. Are you ready to move to an area of pristine landscapes, waterfalls and rippling creeks meandering through mountain valleys? Ready to take the first step to campground ownership? The Restaurant is open just one or two days a week serving local, organic fresh food based on world flavors. The owner says there is a housing shortage for the nearby hospital workers and feels if there were more RV rentals or tiny homes brought in, it would be a great source of additional income. You may have just discovered your new special place to call home, it only took many of the locals one visit and they were hooked! This pristine high desert oasis draws many visitors and they just can’t run out of things to do! From boating, hiking, cycling, and fishing to ATVing where there are numerous trails in America’s most diverse national recreation area. With striking landscapes and brilliant clear waters, this year-round playground spreads across 1.5 million acres of mountains, canyons, valleys, and two vast lakes. The owner has purchased a 2.5 Acres parcel which will house 14 RV Sites and Boat and RV Storage. Site plans are available. Two Parks Wrapped in one Great Price! 19 spacious RV Sites located on 2 acres with a gravel one-way drive. Half of the sites are nestled under the canopy of oak trees and the other half have a beautiful view of the wide open sky! Guest laundry with coin-op washers and dryers. Modular home for the live-in owner or manager. Grassy area with picnic table for cookouts or relaxing. Large metal building for lawn equipment and tractor storage. WIFI and security camera. This park caters to out of town workers and serves them well. The bonus second campground is located 30-40 miles southeast of the Winnie campground. Serving the Beaumont, Nederland and Port Arthur areas with 6 RV Sites. All sites have a gravel base and 3 of the 6 sites have permanent residents. This area is close to all refineries. Destination Park / 2 Income Sources! Located in a high desert area that may give the impression of an area devoid of scenery from a distance, but it is full of surprises! Visitors love this area because it’s centrally located and offers easy travel to many favorite destinations from National Monuments and historic hotels to festivals and rodeos. These owners began their journey into the world of business ownership in 2006. Over the past 12 years, some of their best experiences were meeting truly unique and awesome people from all over the world, including Germany, England, Scotland, France, and Afghanistan. Catering to snowbirds and tourists visiting the areas three National Parks, windfarm and railroad workers and everything in between. Recent improvements: added a propane dispensing station, currently remodeling the old “exercise and gathering room” and converting to a restaurant with opening slated for summer 2018, remodeling some of the Motel rooms, remodeling the bathhouse and the list goes on! The area is rich in history, gold mines, agriculture, cowboys and cattle drives, old miners and new enterprises. Vast open lands, mild winters, and the irresistible desert vistas make the area a favorite spot for winter snowbirds and off-road enthusiasts. Ready to leave the large shopping malls and busy rush hour traffic behind and enjoy a quiet and unique lifestyle in the land of sunny skies, warm days, and desert beauty? Offered by Steffens & CO Realty, Inc. LOCATION: This property is located in South Fork, Colorado, on Hwy #160. The town of South Fork is 2 miles east and offers shopping, restaurants, repairs, lumber yard, ATV dealers/rentals, and small grocery store. Creede is 24 miles, Del Norte, which has a new state of the art Hospital, is 16 miles, Wolf Creek Ski Area is 20 miles, Pagosa is 45 minutes, Durango is 100 miles, Alamosa is 50 minutes and offers commercial air service twice a day. ACREAGE:17.5 deeded acres M/L and borders State Land which goes into National Forest lands. Numerous rock outcroppings and pine trees throughout the property. Ute Bluff Lodge also has two highway access points into the property off Hwy 160. 1. Main log home living quarters has 3 bedrooms, 2 baths, a large kitchen, bar, living room, fireplace, office, small retail room with oxygen stations and check-in desk. The home is full log construction containing 2489 sq. ft. with 294 sq. ft. log commercial laundry room, 592 sq. ft. covered porch and 180 sq. ft. enclosed porch. a.1386 sq. ft. full log cabin has two separate sides. One side sleeps 10 and other side sleeps 6. All have a full bath, propane heat, kitchenette, and porch. b.1364 sq. ft. full log cabin has 3 separate rental rooms and can sleep, 16 people. All have full bath and kitchenettes with porches. c.1497 sq. ft. full log cabin with Mezzanine area of 564 sq. ft. which offers full kitchen, bath, and meeting room for all customers. Along with 2 separate rental rooms, one for 2 people and the other for 6 people. All have full bath and heat. 3. The main lodge is 5216 and full log construction containing 21 rooms with some having kitchenettes and handicap assessable. See Lodge Room Layout for a description of rooms. 4. 384 sq. ft. maintenance shop and another small building for equipment. 5. 21 RV spaces with full hookups with internet and great access. 6. The recreational area containing two hot tubes and grills, new large Teepee, fire pits and play area for enjoyment. 7. Laundry facility and ice maker for clients. 8. Hospitality log cabin full kitchen, library, and DVD library. 9. A beautiful wooded mountain walking trail surrounds the Lodge and offers peace and quiet while enjoying panoramic high mountain views. 10. The Rio Grande River is 100 yards away and offers world class Trout fishing, rafting, swimming, and tranquility. A. The Rio Grande River is 100 yards and offers world-class trout fishing. B. Wolf Creek Ski Area is 20 miles with some of the best skiing in the USA. J. Biking, Boating, and Rafting. 118 people for lodging and 21 RV spaces. This park is exactly what you hoped for when you played the board game, LIFE as a kid! The desert landscapes are some of the prettiest places in the country and the mountain areas have some of the best outdoor activities in the entire southwest! This area sits at 7,500 feet, on the west side of the highest peak in the state and is the getaway for full immersion into its natural beauty. This is where tourists find the rare trails into the National Gorge, trout fishing for every skill level, and mountain lakes with trails that access the highest reaches of the mountains that overlook the area. Cycling, mountain biking, horseback riding, and rock climbing, along with ATV’s, OHMs, ROVs, all allowed within town limits for the purpose of accessing the trails are other very popular tourist activities! This park is pampered and well cared for, with second generation owners. The water, sewer, and electric has been upgraded in the last 5 years. All buildings were updated with log siding or lap wood siding, and all cabins have been remodeled. A well-designed walking path runs alongside the river on the south side of the property. The main lodge building has a camp office/registration area. This building has 2 bedrooms, 2 bathrooms, and a full kitchen. This could be utilized as a manager’s home. Ready to Move out West? This super clean RV Park is 11 years young and open all year! This is ideal for the retired folks who want to supplement their income! Located in an area where guests find rocky slopes and canyons, cactus, grass, thorny shrubs, an occasional tree, caves, and lakes! Visitors to this area find lots of cultural activities, epic blue skies and the opportunity to enjoy green chile cheeseburgers!